While Humpty’s explanations are useful (and, of course, amusing), I’m not sure how necessary they all are. Much poetry is just as much about sound as about language… For example, the very sound of the word ‘slithy’ gives us a pretty good indication of its sense. Many of the other ‘nonsense’ words in the poem – gyre, gimble, wabe etc. – also make a strong impression , even though, like Alice, we may struggle to understand what these words actually mean. The onomatapoeia in Jabberwocky serves to create Carroll’s fantasy setting and we are transported to another time and place. Other unfamiliar words (gyre, gimble, wabe) and creatures (Jabberwock, Jubjub bird, Bandersnatch) add to the sense of epic, befitting the ‘David versus Goliath’ narrative – the slaying of a fearsome monster by a boy. To read this to ourselves – as we might when reading Through the Looking Glass, in which it appears – is one thing. But to hear it being read out loud – as Roger May does in our new collection of Carroll’s poetry – raises the poem’s impact to the level of mock epic. Mock epic might also accurately describe Carroll’s longest poem, The Hunting of the Snark, which takes place on ‘the very island where the Jabberwock was slain’. Featuring some of the creatures in Jabberwocky – the Jubjub bird and Bandersnatch –, the expedition, consisting of ten hunters with a description beginning with the letter ‘B’, culminates in the discovery that the Snark is actually a (deadly) Boojum. The reception on the poem’s publication was mixed, with some calling it a ‘failure’ and ‘not worthy of the name of nonsense’ – possibly because it does not fit comfortably into a single genre. Subsequently there has been much discussion about the poem’s meaning and Carroll himself agreed with one suggestion that it is an allegory of the search for happiness. While we may remain perplexed by some of the ‘nonsense’ language which Carroll deploys, we can nevertheless derive much listening pleasure from these delightful poems. 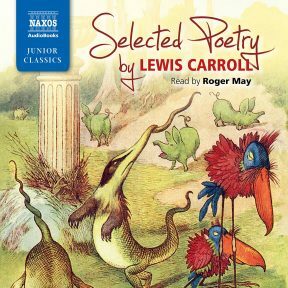 Selected Poetry by Lewis Carroll is now available on CD and to download.